Merci à Corey yet again! When I think of swish when it comes to alcoholic beverages, I think of people who buy liquor barrels just to add water to it to get some of the alcohol out of the wood.. Hell, every time someone here in Manitoba asks me who to contact over at the Crown Royal factory about getting an empty barrel, it's never for home brewing or for decoration, it's to be a cheap weirdo and try to get drunk for cheap. Bissell Brothers out of Portland, Maine also have Swish but in this case Swish is a Double IPA and not made from extracting liquor from the barrel's wood! 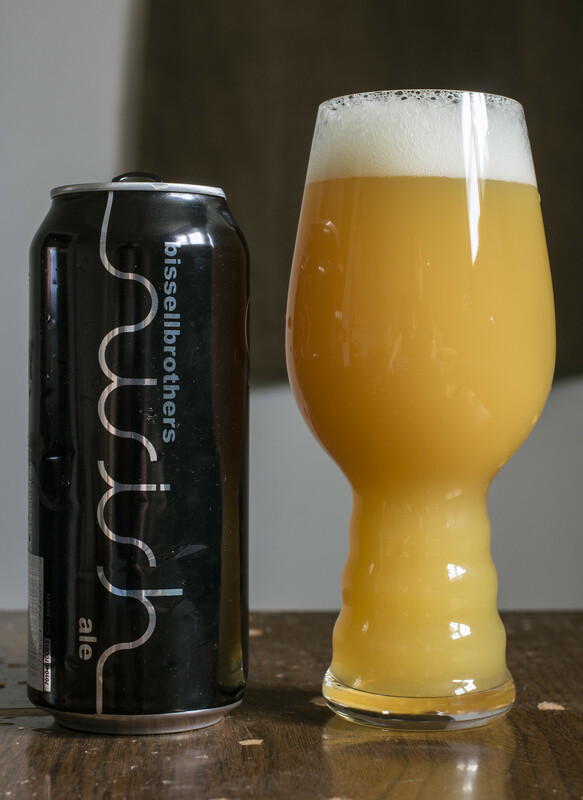 Bissell Brothers' Swish is currently regarded as one of the top juicy IPAs on the market right now and with Maine, Vermont and Massachusetts being the frontrunner in the New England IPA scene (duh), it makes sense that Maine would be producing some delicious, juicy, floral beers! Swish is brewed with mosaic, citra, simcoe and apollo hops and tops out at 8.0% ABV and 80 IBU. Appearance: Swish pours a cloudy, light orange creamsicle body with a moderate amount of snow white head on top and a decent amount of residue on the side of the glass. It kind of looks like Tang or a smoothie for the most part. Aroma: Incredibly liberal aroma! After I poured the beer into the glass, I sat back a metre or so away from the beer and I could still smell the tropical aromas of the beer. I'm getting notes of pineapple, a sharp bitterness of pine, some other floral and grassy hop notes as well. The hops are very much present and mingles well with the juicy tropical flavours in the beer. Also getting notes of orange peel zest, a mild amount of grapefruit and a bit of lemon for a bit of a tartness. Taste: So far, this is one of the stronger New England IPAs I've had - It's incredibly juicy with notes of pineapple, orange zest, apple peel and lemon (among other fruits), I also get a heavy hop bitterness that's more reminiscent of your typical classic American IPA - there's a sharp bite of pine and grass lingering all over the place in this beer. The mouthfeel is somewhat creamy but not as creamy as the Julius I had the other day. There's a bit of a throat burn from the hops but it's so so so so worth it just to be able to savour each and every sip! Overall Thoughts: Amazing juicy IPA with a very solid bitter appearance from the medley of hops used for this beer. At 8%, I can definitely taste the booziness in this beer since I'm getting a bit of a burn from it but yum! For the most part, this is to be savoured and not to be drunk quickly. Enjoy!